Renovations to an inn on the north corner of St. Sampson's Square in 1930 led to an exciting discovery, when the remains of a caldarium, or steam bath, from the Roman city of Eboracum was unearthed..
St Sampson's Square stands just to the south of the site of the porta principia sinistra, the south-eastern gateway of the Roman legionary fortress of Eboracum. The caldarium, and a neighbouring plunge bath, have been excavated. 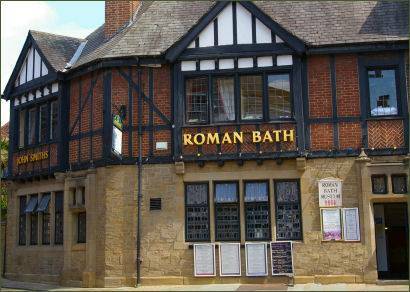 The pub used to be called the 'Mail Coach Inn' until 1930, but was renamed the Roman Bath due to the importance of the find. Opening up this discovery to the public has provided an insight into Roman Eboracum. The bath belonged to the city's military fortress, which dated to the fourth century AD (the fortress itself was built in 71 AD). 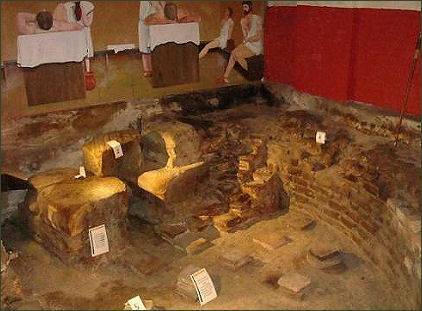 The small museum is situated around 15 feet below ground, and is accessed through the Roman Bath pub, it shows the remains of well preserved semi-circular bath that has at steps at both ends. and displays Roman artefacts and replica articles of everyday Roman life. 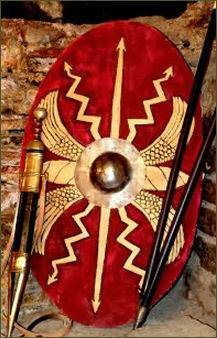 There are interesting facts and figures about life in the Roman city of Eboracum scattered about the museum on placards, and visitors can view armour, weapons, and Roman tiles. 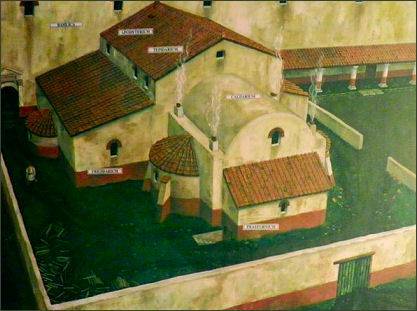 Some tiles appear to show the seal of the ninth legion, who founded the city of Eboracum in 71 AD. The floor of the room was originally raised on columns or pilae of specially made tiles. This provided enough space for hot gases from the furnaces to circulate beneath the floor to heat the room.